July 4, 1788. Come for the beer, stay for the bibliography. “In Honour of American BEER and CYDER. It is hereby recorded, for the information of strangers and posterity, that 17000 people assembled on this Green, on the 4th of July, 1788, to celebrate the establishment of the Constitution of the United States, and that they separated at an early hour, without intoxication or a single quarrel. They drank nothing but Beer and Cyder. 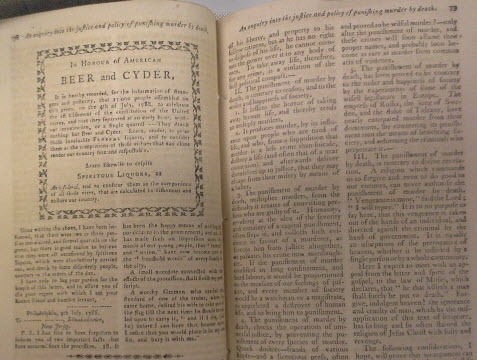 Learn, reader, to prize those invaluable FEDERAL liquors, and to confider them as the companions of those virtues which can alone render our country free and respectable. In celebration of Independence Day I thought I would share this amusing tidbit brought to my attention by Elsa Varela, one of our wonderful catalogers. It comes from the final page of an account of the July 4th festivities in Philadelphia in 1788 compiled by Penn alum (and signer of the Declaration of Independence) Francis Hopkinson. Though perhaps unfamiliar to us, the jubilant anti-liquor sentiment expressed by the writer was not particularly surprising at the time. 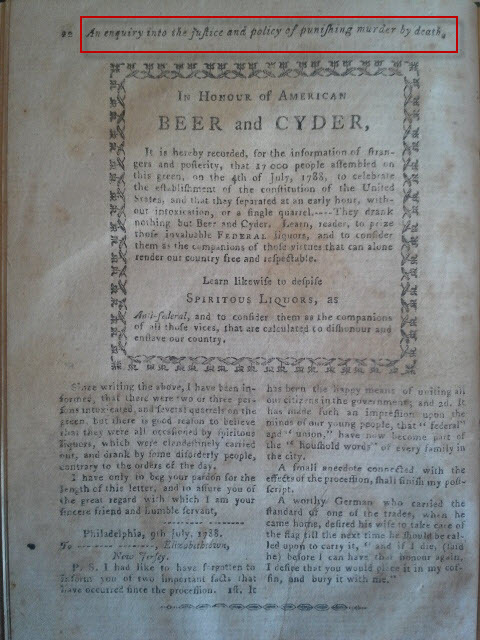 The featured speaker at the 1788 event, whose speech is printed in the pamphlet extolled the virtues of “Frugality and temperance.” Likewise, temperance tracts and essays made the rounds of American cities and newspapers reprinted sermons on the subject. 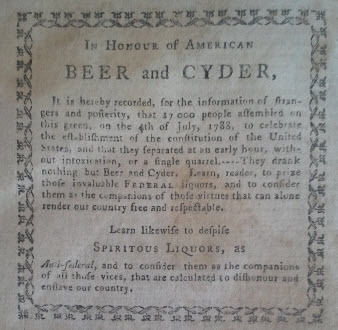 Many would have known the famous doctor and signer of the declaration Benjamin Rush’s writings on the subject – just that year in fact he had spoken to the American Methodist Conference about the dangers of alcohol and by 1790 he had developed his well-known “moral and spiritual thermometer” of types of beverages. Now for the bibliography! After pondering what kinds of antifederal activities are likely to happen in Philadelphia tomorrow, I found myself curious about the running title across this, the last page in the pamphlet, it read: “An enquiry into the justice and policy of punishing murder by death.” An odd title to have especially because nothing on the page or in the entire pamphlet related to capital punishment. Account of the grand federal procession, Philadelphia, July 4, 1788, p. 22. It turns out that the separate printed pamphlet I began with, like many others of the time was reprinted from type already at hand for the printing of the American Museum by Mathew Carey, the publisher of both the magazine and eventual pamphlet. He added a new title page and page numbers but the job was done quickly enough that the orphan running title was left in on the final page – clearly there was a lot of demand to know just how sober and respectable things had been on Independence Day.